TERRATEST exhibits the Light Weight Deflectometers for the dynamic load plate test TERRATEST 4000 USB and TERRATEST 5000 BLU from the 14th to the 16th of May at Autostrada Polska 2015. AUTOSTRADA POLSKA is a specialist trade fair. Spread across an area of about 11,000 sqm, it attracts approximately 500 exhibitors and more than 15,000 professional visitors each year. It is one of the biggest and most important road construction fairs in Poland. This year it will take place for the 21st time in the central Polish city of Kielce. To TERRATEST the fair is of central importance for trade relations with Central and Eastern Europe. TERRATEST maintains contacts not only with Poland but also with the Baltic countries, Ukraine and Russia. “We exhibit our Light Weight Deflectometers for dynamic load plate test already for the seventh time in a row at Poland’s most important road construction fair”, says Slavomir Furmanczuk, TERRATEST’s sales director for the Polish market. 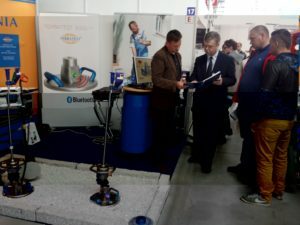 “Our numerous clients from Poland and the Baltic countries enjoy visiting us at our TERRATEST exhibition booth, in order to catch up on information about the latest innovations of our Light Weight Deflectometers for the dynamic load plate test.” Recently, the firmware of the Bluetooth device TERRATEST 5000 BLU was relaunched, the LED control is now even more user-friendly, turning the Permanent Testing Mode (PTM) into a comfortable feature, which simplifies testing in continuous measuring mode. “Generally we’re experiencing a continuously growing interest in our Light Weight Deflectometers in Poland. This is surely connected to an increased quality awareness of our Polish neighbours but also to the growing quantity and quality of the infrastructure projects”, says Frank G. Schulz, CEO of TERRATEST GmbH Berlin. “The user-friendly handling of the Light Drop Weight together with its precise test results are unbeatable arguments for the dynamic load plate test. TERRATEST 5000 BLU, the only Light Weight Deflectometer in the world with Bluetooth technology, is currently in great demand. Over and over again the users marvel at the possibilities which the dynamic load plate with Bluetooth technology and app connection offers. The conventional cable connection of the Light Weight Deflectometer for the dynamic load plate test has been replaced by innovative Bluetooth technology. This is a great advantage, since it is no longer necessary to re-connect the load plate, which is placed on the ground, for each new test”, adds Schulz. TERRATEST GmbH produces the only Light Weight Deflectometer for the dynamic load plate test with Bluetooth, voice navigation and Android app for smartphone or tablet in the world. “We spoke to numerous potential clients at AUTOSTRADA POLSKA. The prospective customers were fascinated by the user-friendly operation of our Light Weight Deflectometers. They are surprised by the possibilities that our Bluetooth device TERRATEST 5000 BLU offers. For TERRATEST the AUTOSTRADA was more successful than expected again this year and we will surely be present with our own exhibition booth in Kielce next year to present the most recent developments of the Light Drop Weight for the dynamic load plate test”, adds Furmanczuk.